Is it just me, or does anyone else think the above Christmas decoration looks like a Santa version of a lost soul from Doom 2? Liked the Christmas spider pic. AU seems to have such interesting creatures. I also like the magical touch you have in decorating your tree. 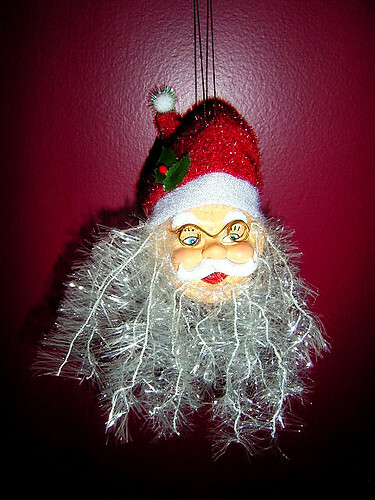 That creepy Santa is a totem to ward off evil spirits and phone salespersons, right? Meanwhile, Aussie Christmas is the same as any other Christmas except it’s to hot to move or do anything. It’s not that special. Wow, this comment preview thingo just rocks, doesn’t it? Looks a bit like great aunt Liz. Except for the hat, that is. I reckon it’s Dr. Kintobor, mortal enemy of Sonic the hedgehog in disguise! You need to set fire to his beard and throw it at someone.